Filmmaker Susienthiran has always attempted to make movies based on realistic themes and has never missed to win the attention of universal audiences. 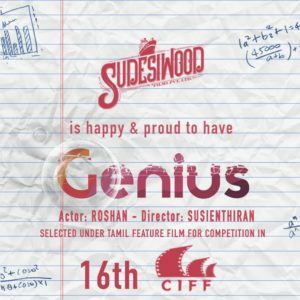 His recent release ‘Genius’ has now gained a prestigious honour for being selected under Tamil Feature Film for competition at 16th Chennai International Film Festival. The film centers on a contemporary issue of how heavy pressure at academics and professional work pressure can impact an individual’s life. Roshan made his debut as an actor with this film, which is produced by Sudesiwood Films Pvt Ltd.
Yuvan Shankar Raja has composed music for this film, which has lyrics written by Vairamuthu. RB Gurudev (Cinematography), Thiyagu (Editor), G.C. Anandhan (Art), Amudheshwar (Dialogues), Shobi and Lalitha Shobi (Choreography) and Anbariv (Stunts) form the technical crew. Aadukalam Naren. Jayaprakash, Singam Puli. Priyaa Lal, Meera Krishnan. Erode Mahesh and few more prominent actors have played important roles in this movie.